Over my lifetime I’ve done a few things that have stretched me to limits I didn’t know existed, finding on the backside that the human heart must be limitless. This can come in relationships – obviously – but it is also in the physical challenges. As my old roommate, who is a Navy SeAL, once said, “Our bodies are capable of far more than our minds let us believe.” I’d add that the heart must be the space that stretches this. 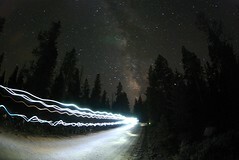 I got to see this first hand during a trail race in Colorado called the Leadville Trail 100. It might just be the best argument that certain people (distance runners) are truly crazy. A month or so ago my friend Cindy asked me if I would be part of her pace crew for this insane race. And to my surprise I said, “Yeah, that could be fun.” Since running my part I’ve been trying to grasp what it did to me, aside from destroy my toes. My part of the job, along with a few others, was to meet her at various aid stations over the 100 miles and makes sure she had what it took to get to the next aid station. Oh, and we were to run some of the last 50 miles with her. As it turned out, I was running the first and last legs of the last 50 miles totaling about 23 miles for my part. Not to mention that this race takes place from 4am on Saturday through Sunday 10am –30 hours w/o much sleep –starting at 10,200 feet above sea level. And to boot, my first leg was 10 miles up and over Hope Pass with a 2,500 vertical ascent over 3 miles. And once I finished this leg I had about 7 hours through the night before I ran another 13 miles to the finish with her, the last 4 miles up hill. If you think I was a nut case, imagine her sanity to do all 100 miles. And that she did, finishing strong. I can’t even touch what it is like to be beside someone as they endure and finish something as mind-boggling as this race. For all the insanity-jokes, there is an awe and respect that has nothing to do with words. To go through some of the experience with her changed my perceptions of my self, my abilities, and set fire again to that kid-part of me that truly is game for absurd adventures. Minutes before starting that first 10 miles I felt that tap on the shoulder and heard that reminder that this is going to be fun and I should enjoy myself no matter what comes. I had been caught in nervousness and self-doubt ‘till then, seriously reconsidering the whole game. An hour or so later, taking a break above treeline, looking back over the shadow and sunned valleys below I smiled with that knowing that yes, I was having fun. And then we ran on, over the pass to an aid station surrounded by Lamas, ate mashed potatoes from a coffee cup for a few minutes and then we were off again down to Twin lakes. Surreal fun! It is possible to celebrate Life by seeing how far you can stretch it, even if it is running 100 miles through day and night, over trails and mountain passes. Yeah, we can do far more than our minds let us believe. Life seems to beg for those who dare see how far to take it. I know for myself, I found another playground of the heart I’d forgotten existed.